In this ultra competitive market place we live in today, companies need to come up with a value proposition that sets them apart from the rest. They come up with statements that have a clickbait effect. "Custom shirt/suit in two weeks", "Buy one, get three free", "With each purchase we'll donate $1 to save the pandas" so on and so forth. I was watching TV one day and saw a commercial for MTailor. This name sounds familiar since some other youtubers have reviewed their product. They have the eye brow raising claim of getting a custom shirt measured through your phone in 30 seconds. Now I've had some experience in the custom field and I was quite skeptical that I was going to get a custom shirt, made to my body specification without a tailor measuring me. Even better! My phone is going to do it! What? HOW?! So without watching anybody's reviews, I wanted to formulate my own opinions to see if their bold claim is true and what kinda of sorcery, I mean, algorithm they got that would customize a shirt for me without a tailor. Save your gas money, bus pass or train ticket! Let your guard down knowing you aren't going to be heckled by a salesperson trying to upsell you. All you need is you cellphone, in the comfort of your home and quite frankly you don't need to wear alot of clothes! The MTailor custom shirt process starts with downloading the free app at the app store. Once downloaded, the first screen you'll see is the custom options from shirts, to suits to jeans to everything in between. I chose the shirt because I've been looking to a particular type, button down collar. Next up is the fabric and pattern screen where you choose the exact shirt you want, I opted for the Navy Dobby, a lightweight cotton fabric that would be great for this spring/summer season plus the fact that navy is one of my favorite colors. Then you get to pick what collar spread you want and they have widespread, straight point, casual button down, cutaway and button down. 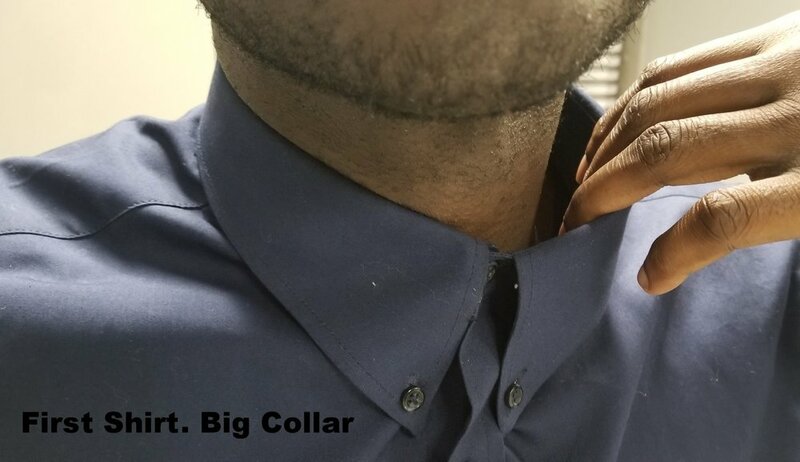 I don't have any button down and with the summer coming I want to be able to wear lightweight dress shirts and not have the collar flaring out, a pet peeve of mine. For the sleeve button I chose the one button round, I usually go for the horizontal two button but they didn't have that option. But if you prefer french cuff, they have that option too. The next screen determines the length of the shirt if you plan on tucking it in or not, I usually tuck in my dress shirts. And on the final screen get to choose your button type, pocket or no pocket, the size of the sleeve depending if you wear a watch or not and whether you want contrasting collar and cuff (definitely my next shirt!). And that's it! Shirt specifications picked! All for...............$69? Wow! the next part is the most interesting. So you've picked out the shirt you want and how you want it. Now comes the fun part. what you'll need for this next part is your phone and a tight shirt or you have the option to go shirtless. The app then assists you on positioning the phone on the floor, at an angle leaning up against a wall. Standing back 7 feet with your tight shirt(or shirtless), it tells you position your body on a Y shape with feet shoulder width apart. Spinning slowly 360 to the left, the app records your full body image and that's how it somehow gets your body measurements. They claim to delete the video once they get your measurements so you'll have to take their word for it. I currently have two Mtailor shirts but I only wanted one. The reason being when first shirt came it was 99% perfectly fitted to my surprise! Whatever algorithm they got going on with that app works! Let's break down the shirt. The 1% I wasn't happy with was the collar size. The collar on the first shirt was a bit bigger than what i'm use to. I thought about keeping it like that so I can "grow" into it but I decided to reach back to their customer service to see if they can get it fix. They were apologetic about the mishap and agreed to correct it. That was the only part that needed fixing and the second shirt came back perfect. They were at a good length coming down to my wrist, allowing me to show a little cuff with my suit jackets. A shirt concern i have with all shirts but especially this one since it was not measured by someone was how well will it fit around my biceps and triceps without it uncomfortably digging into my skin. well it fits, arms folded or relaxed. It is cut close to the body but not too close where it is visibly tight. Tight enough tot be comfortable but not so snug that the buttons are holding on for dear life, easily in the chest area. Another fit man problem. It is right about this time our warbrobes start to change, putting away heavy fabric clothing and bringing out the mid to light fabric one, still need to hold on to a jean jacket or two for those brisk spring days. One article of clothing that you will be seeing around this time is…….